In this post, I will be introducing to you guys the big group of cetaceans – which is mainly divided into two sub groups. The Odontoceti and the Mysticeti! 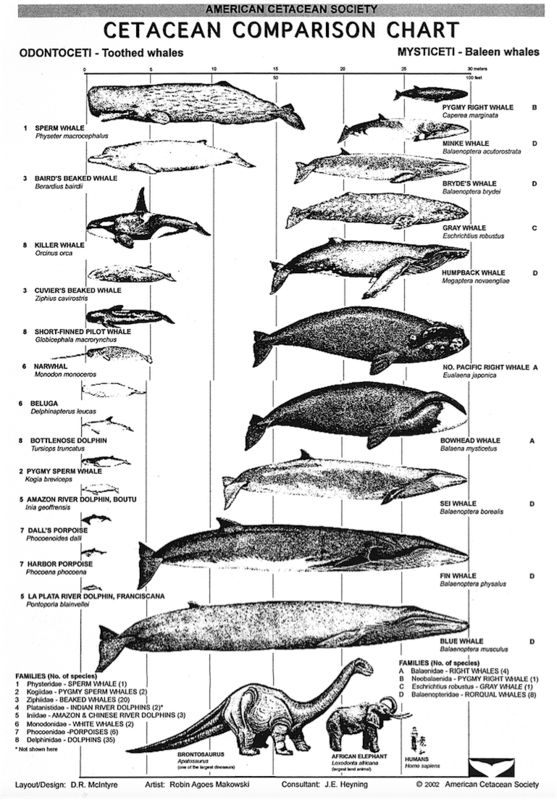 This amazing chart on the left is taken from the American Cetacean Society show casing the relative size of different species of cetaceans, characterising them under Odontoceti (left) and Mysticeti (right). As you can see from the chart, most Odontoceti species are noticeably smaller in size compared to the Mystecetis. In addition, other visible physical features include the difference in dentition – Odontoceti have teeth, while Mysticeti have Baleen plates; and also the number of blowholes – Odontoceti only has 1 blowhole, but the Mysticeti has two! 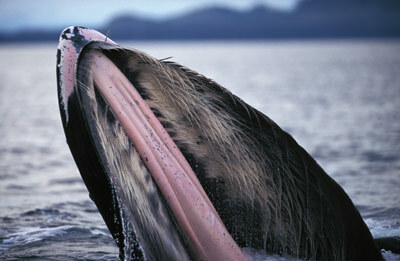 Mysticeti have baleen plates on their upper jaw. These keratin plates help in ‘fliter feeding’. Their diet mainly consists of plankton and krill. Mysticeti actually came from the greek word, mystakos – which means moustache. 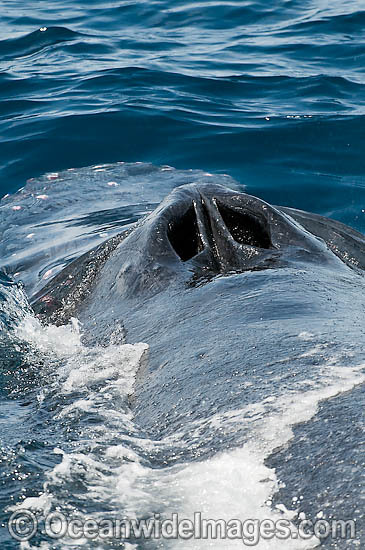 Isn’t it cute to name a whale by its moustache? When I was younger, I used to think that dolphins and whales squirted out water from their blowholes. The water that you see in videos and pictures coming directly from the top of the dolphin or whale, actually reflects how powerful the exhalation or the chuff by the marine animal is. Exhalation occurs first to prevent the animal from accidentally allowing water into their lungs, and to remove any water that was already inside. The muscular flap then shuts quickly after a breath is taken in. Then why do the baleen whales (Mysticeti) have two blowholes? The answer is simply to increase the efficiency in exchange of gases for each breath taken. Because they are much larger in size and body mass, having two blowholes grants them a larger intake of oxygen for deeper and more prolonged diving. A Sperm Whale (an Odontoceti) can hold its breath for up to 2 hours. It is known that other species of Mysticetis can hold their breath for as long as 2 hours as well. The Indo-pacific bottlenose dolphins (Tursiops Aduncus) that I had worked with are under the Delphinidae family (under Odontoceti), uses their only blowhole to first exhale quickly, then take in a deep breath. These dolphins generally breathe about 5-15 times within a span of 5 minutes. I hope this post has allowed you to understand the two subgroups of Cetaceans! Do comment and let me know if you like Odontocetis or Mysticetis more! Stay Tuned to CetaceanOfTheMonth for August coming up this week! Feldhamer, George A. Mammalogy. Boston: WCB/McGraw-Hill, 2007. Print. PP334-335. Cetaceans have adaptations to help them take ‘deeper breaths’ – thereby allowing them to extract more oxygen from the air. 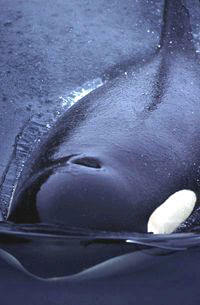 Humans can only exchange 10-20% of the air in their lungs, whereas cetaceans are able to exchange an astounding 85-90%! In fact, as contradictory as it seems, “Cetacean lungs are relatively small, compared with their body size”. 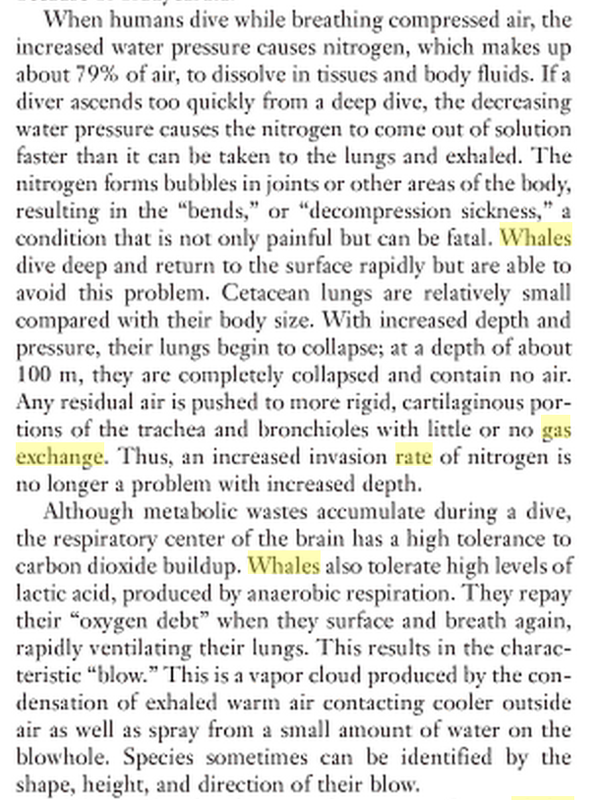 The adaptation comes not in terms of the relative lung to body size ration, but instead actually is the greater percentage of red blood cells that enables the cetaceans to dive for prolong periods. Lung to body mass (or size) ratio influences another factor for these cetaceans – the ability to dive deeper where water pressure will be different. This is another interesting topic that I will highlight in another post after gathering more information! For now, here is an extract from Mammalogy, written by George A. Feldhamer on page 3351 if you are interested in finding out more about what is to come! It is an excellent read if you are a frequent Diver and understand what Decompression Sickness is.